"When sanat-kumAra said like that to me I again asked him for further details... all that from beginning, oh, gAngeya bhIShma, you listen from me..." Thus sage mArkanDeya said to bhIShma. "How many observances of fatherly-gods are there, and where those enrichers of life-principle of gods are abiding..." Thus mArkanDeya is asking sanat-kumAra. Four kinds of manes with divine manifestation are: sukala, angIrasa, susvadha, soma-pa; three kinds of manes without physique, subtler than sky, and who are able to enter even the womb of a super-microcosmic atom - paramANu udare api pravishanti - are: vairAjA-s, agniShvata-s, barhiShada-s.
Firstly the groups without manifestation, formless fatherly-gods, are taken up for clarity, of whom vairAjA-s are being narrated. Formless fatherly-gods I - vairAjA-s. Even women are entitled to offer offertories to manes. eSha stiyo api adhikAro sati shrAddham dadatyaH... They too are destined for the release from karmic cycle if they offer offertories to their manes. But, without involving womenfolk in the rigorous rituals, their participation is adjusted in sankalpa mantra saying 'mama saha kuTumbAnAm...' etc. Mt. mainAka is the famous winged mountain hidden undersea for fear of indra, but came up once to help hanuma when jumping over the sea. The king of the mountains, namely Mt. himavAn, begot three daughters through lady mena. They are a-parNa, eka-parNa, and the third eka-pATala. Of the three damsels uma is the eldest and foremost in possessing yogic prowess, and she is given to mahadeva, shiva, in marriage. There is a reading difference in the names of asita and devala. 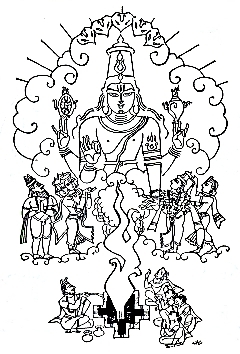 Telugu version of errapraggaDa, one of the three authors of Telugu mahabharata, says in his translation of harivamsham that ekaparNa is married to asita and begot devala; ekapATala is married to jaigISha and begot shankha-likhita. Gita Press combines the names of asita and devala as one. Formless fatherly-gods II - agniShvat-s.
Next in the triad of formless manes is called the highly resplendent agniShvat-s; agniShu- agni karmAsu; AttA- gR^ihItAH - those that chanced in the ritual fire intended for manes. Their abode is called soma-pada, an abode for the children of mariachi prajApati, where gods venerate them. Their brainchild is damsel named achChoda who later became a river with the same name, from which a vast lake with the same name - achChoda had emerged. She has not seen her fathers at anytime, but at certain time she took flight skyward to have their glimpse. Though she could visualize some celestials there, she could not perceive them because of their imperceptibility. That best complexioned damsel achChoda has then sighed for not spotting her parents. While she is still up in the air she saw glorious amavasu, the son of ayu, viz. parichara-vasu, who by then is going in an aircraft along with an apsarasa named adrika. Then achChoda went into a flight of fancy thinking, "how nice it would if this air-voyager, namely parichara-vasu, happens to be my father!" While falling from sky, upside down, she caught sight of an aircraft which is of the size of a flaw-speckle in a jewel, trasa-reNu; trasa [trAsa]= a flaw in a jewel; reNu= speck; in which there are three fatherly-gods, who are though imperceptible and tiniest of the tiny, are glowing like the irradiated ritual fire... Then she instantly yelled at them crying, "save me... save me..."
You will become the daughter of that king vasu through lady adrika, whom you have just now seen along with uparichara-vasu on aircraft... all this happens in twenty-eight dwApara era... then you will emerge as the daughter of a fish, namely from this lady adrika who by then transfigures as a fish..." So said the fatherly-gods to damsel achChoda and went their way. Later, that damsel achChoda took birth as satyavathi, sired by uparichara-vasu, mothered by apsara-turned-fish, namely lady adrika. Then achChoda is called lady satyavathi, apart from her many other names like gandhavati, gandha kaalii, matsya gandhii, yojana gandhii, vaasavi, kalangani, daashanandini, daseyi, jhajhodari, and matsyodari, etc. Hence she is the daughter of a vasu, namely amavasu, or uparichara-vasu. "Thus this is some account of second group of formless fatherly-gods..." sanat-kumAra continued to sage mArkanDeya. Next, barhiShada-s, third kind among the formless manes is being described. A lengthy account about this achChoda/ satyavati is given at 10-47 mbTn, available on this webpage of mbh resources. Births of gods and demigods are not by parturition. Note: God is never born like an ordinary child. The popular impression that Vedavyasa was born and that too when Satyavati was a virgin is not correct. - Pt. k. t. panDurangi. Formless fatherly-gods III - barhiShada-s.
nAga-s, including reptiles and birds adore..
Their brainchild will be a damsel named pIvari, which is just an epithet of that girl meaning she who is full of or abounding with; because she is really abounding with yogic schooling. She herself is a yogin, wife of a yogi, mother of a yogi. That righteous yogin will emerge when dwApara era approaches. The second foot of the above verse, kathA yatra samutpannA vR^iShNyandhakakulAnvayA - HV_13.49; and next foots in later verse, generally do not appear in some mms. With this line it can be construed that the characters of mbh have emerged out of formless fatherly gods. So far I have narrated about three groups of formless manes. Next, listen to the legend of four kinds of manes possessing divine forms, namely sukala, angIrasa, susvadha, soma-pa..., of which let us talk about sukala group first... "sanat-kumAra continued his narration. sAdhyA-s are a kind of gods, foremost hosts to chant and popularise veda-s, obsolete with veda-s. But their collective name remained as an epithet to brahamaNa-s, because of the similarity of the function of chanting veda-s. Here is a reading problem with the name of shuka. Elsewhere this name is read as shukra, the letter r being the difference. At 1-18-24 above, while telling about the sons of ekaparNa, ekapATala, harivamsham does not say about the progeny of aparNa, say pArvati. We are told somewhere else that shukra-AchArya, the mentor of demons, is kR^itrima putra, the artificial son of aparNa, or pArvati - shiva amsha sambhUta - and this damsel gau or eka-shR^i~Nga is the wife of that shukra-AchArya. "I have narrated to you, oh, bhIShma, whatever I have heard from that divine personality sanat-kumAra, which is otherwise impossible to know by humans on earth..." Thus sage mArkanDeya said to bhIShma. Thus, this is the eighteenth chapter of first canto called harivamsha-parva, in harivamsha-purANa, the sequel of mahAbhArata, narrating the institution of fatherly-gods.